In 2017, there were more than 14,000 physicians and surgeons in the state of New Jersey, earning an annual mean wage of $207,340 (US Bureau of Labor Statistics). Jersey City is the second largest city in the state of New Jersey. It has a wide metropolitan area with many schools and colleges. New Jersey has many accredited medical schools from where thousands of students graduate as doctors every year. 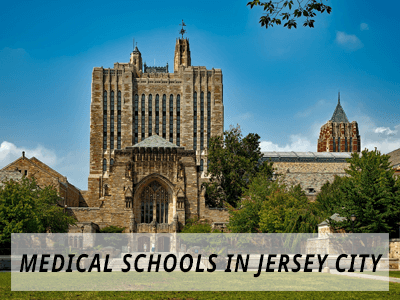 Medical Schools in New Jersey provide degrees and programs in many branches of the medical field that students can major in. These include gynecology, neurology, anesthetics, radiology, and orthopedics. The course content comprises of theoretical based knowledge and intensive lab work. The degrees offered equip the students with the essential skills that can enable them to become successful medical practitioners. They gain insight into various aspects of medical sciences, diseases, ailments and their treatments. The programs offered here aim at training and offering abundant research opportunities to the students. The postdoctoral members are also offered the same to further draw a career in medicine and biomedical research. The school’s research focused curriculum puts great emphasis on the cellular and molecular, physiological, developmental and environmental aspects. The state-of-the-art laboratory is equipped with advanced services, which happen to provide all kinds of genomic, microscopic, proteomic, transgenic and flow cytometry support. This is all if the graduates want to opt for a Basic Science - Cell Biology and Molecular Medicine. From Orthopedics to Neurology, as well as Psychiatry, Radiology, Surgery, Family Medicine and Pediatrics, Rutgers New Jersey Medical School caters to all the fields of Medicine and offers you degrees in all of these related fields and many more. The programs offered here aim at providing the students with advanced training that is above and beyond predoctoral education. The school aims to build confidence and hands-on experience for better career opportunities and overall individual growth. According to the BLS, physicians, and surgeons jobs are expected to grow at the rate of 13% from 2016 to 2026. The source further reports that in 2016 there were approximately 713,800 physicians and surgeons in the US. This number is expected to reach 805,200 in 2026. Q:While searching for medical schools in Jersey City, I came across Diagnostic Medical Sonographer. What is the job description for this profession? A:Diagnostic Medical Sonographer would be mentioned when searching for medical schools in Jersey City. These professionals are an integral part of the health care industry. Diagnostic Medical Sonographers operate imaging equipment in order to diagnose ailments. These professionals are required to help patients with the procedure, take accurate imaging results for analysis and explain the process to the patient. With the help health care industry expanding all over the United States, there is huge potential for students interested in this profession. Q:I want to earn a degree from Medical Schools in Jersey City. Can you tell me the basic details? A:Medical schools in Jersey City offer degrees and programs in many branches of the medical field. These include neurology, gynecology, anesthetics, radiology, and orthopedics. Depending on your interest, you can choose the line of study you want to specialize in. The course content is based on theoretical knowledge and intensive lab work. Q:Are there medical schools in New Jersey that offer online degrees? A:You can search through our page or online to see which schools in this state are offering online programs. Online education is growing in demand due to many benefits. Many renowned schools have added online learning to their program offerings. Individuals who are unable to enroll in campus-based schools can opt for this mode of education.